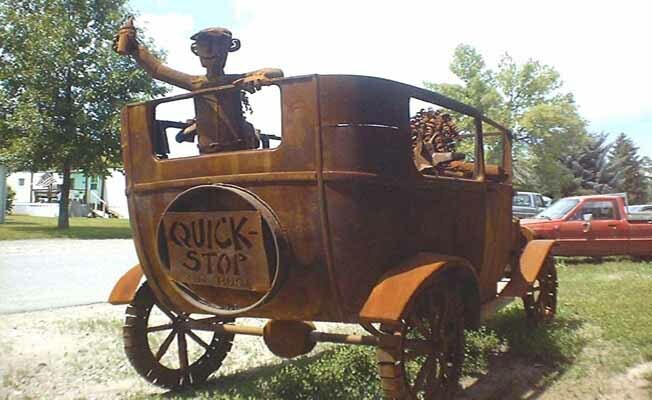 The Quick Stop Drive-In is the 'old style' drive-in, no chain operated menu, but a unique selection of sandwiches and ice cream treats with friendly service. Your order is cooked as you wait. No pre-cooked meals held under a heat lamp. Proud to serve American beef in our Angus beef patties. Over 60 flavors of soft-serve ice cream or slushies. Please stop by for a refreshing break from the long drive. Take a picture of our sculptured Model T-Cars or our collection of wood carved bears.